Clearly we just need a few more treaties – to stop ordinary weather from occurring. 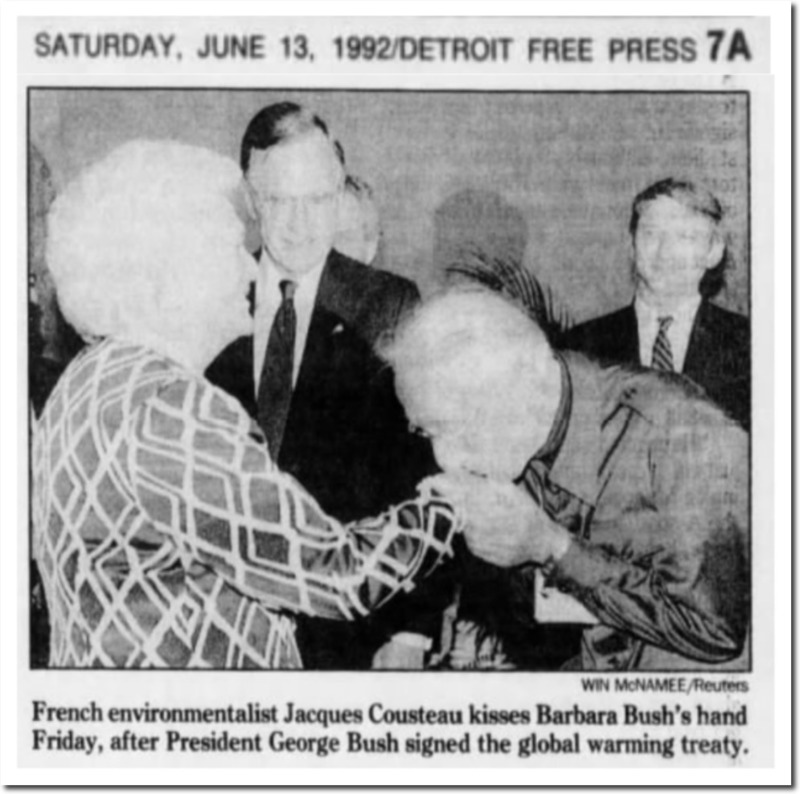 The “Global Warming Treaty” referenced above was just another gambit to extract wealth from productive westerners and hand it over to kleptocrats in Africa, Asia, Central and South America, and the perpetually endangered Pacific Islanders (/sarc). The Americans with Disabilities Act sounded like a nice, sweet way to help the disabled get along in society with some physical impediments removed, BUT it has metastacized into a full-time industry for bottom-feeding lawsuit hustlers. If you try to save/preserve an historic site/building, it ends up getting destroyed by installation of elevators and ramps (which go far beyond the stipulation of “reasonable accommodation”). If you think “reasonable accommodation” for the ADA sounds OK, recall that the Left continues to jammer on about “common-sense gun regulations”. Same argument about “banning hate speech”. The ADA has also severely harmed the employment of the disabled. I have worked for companies that will not hire disabled persons out of fear of lawsuits. A fellow I used to work with (disabled) was one of those lawsuit hustlers and had sued a couple of companies in his past for frivolous things. This is now happening with women, thanks to the MeToo movement. Especially on Wall Street where many firms are very reluctant to hire females for fear of frivolous lawsuits or unfounded sexual misconduct allegations. I don’t blame these companies for these things at all. If I still owned a business, I would be extremely careful about hiring disabled persons, women and minorities. Could not afford to even defend myself in a frivolous lawsuit. The liberal progressive Marxist pieces of crap in our country have brought this all on. It only continues to get worse by the day. as this minority status is being abused whenever there are consequences for their wrong doings and they get fired but there are non when you fire non-minorities. And as we can see that those judges that have infected at universities with marxism will instantly adjust to any new politically correct/progressive reality as they did now with the meetoo movement. Bush also invaded Somalia the month before he left office, just to create havoc for his successor. I was going to say at least he wasn’t as twisted as David Attenborough, but yes he was! Jaques Cousteau and other animal “philantrophist” have made me a lunatic conspiracy theorist already as a little child. the chance to film 2 giant calmars fighting each other is 1:1.0000000.
they showed huge old giant bee hives somewhere in the desert and then they said that sometimes they will catch fire because a drop that did not vaporize can focus sunlight and start a fire. then the beehives started to burn. French kissing in the USA ? You are surprised that the “New World Order” CIA director signed a global warming treaty? New World Order in need of constant fear and conflicts. Well- it is debatable wether Costeau or Lysenko were the first real climate scientists.